Mahi-Mahi are beautiful fish, with colors ranging from bright yellows and greens to light blues and spots ranging anywhere in between. They have it all when it comes to catching them, hard fighting, aggressive eaters, and breath-taking jumps. These deep sea fishing tips will help get those beautiful fish. On Anglers Envy Charters out of Port Canaveral, FL we mainly troll for these amazing fish. Trolling consists of dropping back 5 lines behind the boat with different baits or lures on them. We like to use 3 lines with Ballyhoo and skirts, a diving plug, and a larger trolling lure. In addition, we will run some teasers or dredges. Once we are fishing you can sit back relax and wait for the chaos to start. It usually begins with the screaming of drag, jumping Mahi, hopefully another screaming drag then the fun starts. Mahi usually travel in pairs a male and female so you sometimes get multiple hookups when trolling. FISH ON!!! 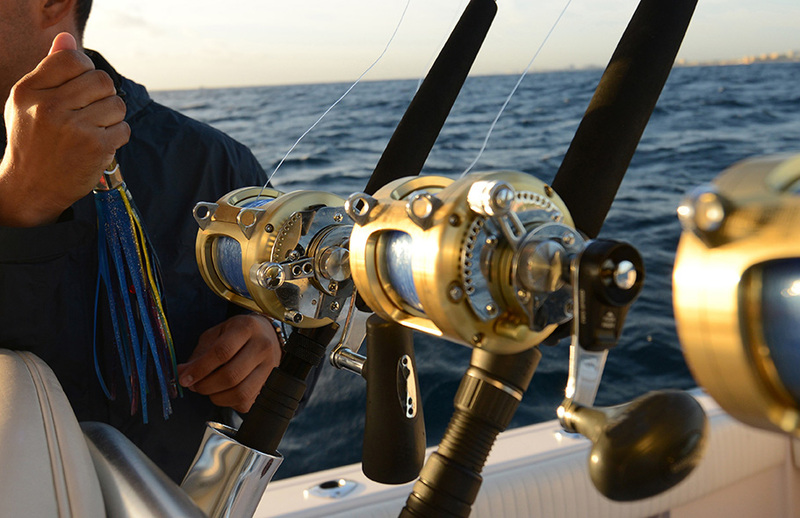 On Anglers Envy Charters we provide our guests with quality reels and rods for salt water fishing. This year as in past years you will use Crowder trolling rods matched with either Shimano Talica 25s. or Daiwa Saltiga 40s. All are reels are spooled with 30lb test which allows plenty of line and plenty of fun when you hook a good-sized fish. If you’re looking to catch good sized fish (15-35lbs) Spring is the time of year you want to go deep sea fishing Port Canaveral. April and May are typically the best months for the bigger fish. The bigger fish are migrating north and are usually gone by June. Not to say that we don’t catch Mahi all summer and into the fall. Just saying if you are looking to catch the bigger fish that’s when you want to go. Charters usually fill up fast during these 2 months. We are super excited this year to be offering charters on a 37VH Freeman Center Console. This boat is big, fast and very comfortable. It is going to allow us to get the fishing spots faster, which translates into more fishing time for our customers. We have plenty of storage for your catch in our monster coffin box and plenty of cooler room for drinks and food. Our Crew loves to fish for Mahi, which makes them very good at it. With over 30 years of experience they know the tricks, tactics, and what to look for to put you on fish. Mahi Tacos anyone? Hopefully you have had a great day on the water and put some nice Mahi in the box. Our crew will clean your catch and bag it up for you. So how do you want to cook it? Fried Mahi always delicious, cut it up into chunks and sauté’ it to make Tacos (No Brainer), Blackened Mahi sandwich on a toasted bun with tartar sauce (delicious). Mahi is one fish you can cook anyway you want and it’s always turns out good. Once you get back to your house with your Mahi rinse it off in the sink, dry it off with some paper towels. It stores better if you keep it in the fridge this way. Grab 3 or 4 filets cut them into bite size chunks. You can either fry them or lightly season and cook in some butter, little bit of white wine and garlic. I like to get them crispy on the outside so turn the heat up on the pan. Get some fresh salsa, maybe a few diced jalapenos, a little bit of cilantro. Now for the coleslaw, you can buy the precut coleslaw and premade dressing. Grab a jar or can smoked haberno’s, drain some of the juice, but not all of it put in a food processor and blend it up. Add that to your coleslaw dressing maybe 1/2 and 1/2 depending how spicy you like it. I also add some cilantro in with mine. Then it’s Taco time: this is how I make mine, soft taco, cheese, mahi, salsa, coleslaw, cilantro. Enjoy! !